So what killed the in-house server and why the big push for cloud? First, lets debunk the common misconception that cloud is something new. It is a new technology for small to medium sized business owners because a decade ago, the SMB could not afford the benefits that cloud computing afforded large corporations; Including increased security, highly scalable environments, remote accessibility and decreased IT costs. With technology advancements, the cloud is now available to law firms of all sizes, which is why the law firm cloud server solution is fast becoming vogue. 1. Scalability – the law firm cloud server is highly scalable in that resources can be added and removed quickly without a large investment in new technology. Traditional, in-house servers require an investment into technology that the firm may grow into over the life cycle of the hardware (3-5 years) versus a law firm cloud server that has high availability and a larger resource pool. 2. Security – Unfortunately there is a growing trend of small to medium sized firms being the target of not only hackers but physical break-ins; The firm and client data are therefore at risk. The security that a law firm cloud server provides is enterprise-class, audited and certified by outside firms for SOC2 and SSAE16 compliance as well as 24/7/365 hands-on security and monitoring. Small to medium sized law firms don’t have the resources to recreate the security protocols that licensed cloud server providers have in place. 3. Offsite Backups – With a law firm cloud server, you have more redundancy as well as backups that are ensured with integrity and offsite. In a local infrastructure, you are at risk of natural disasters, theft, corrupt data files and much more. 4. Multiple Offices – Many firms have multiple offices which cause problems with not only document sharing but also with licensing of software and version control. If you have a local infrastructure, the task of networking and managing the system are on the firm. 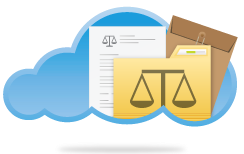 With law firm cloud server infrastructure, licensing is reduced and centrally located for all offices and workers. 5. Simplified PC Maintenance – the local environment has applications and operating systems installed on the workstations and/or servers so it is the firm’s responsibility to keep them up to date and maintained. In a cloud environment, there is nothing installed locally so there is simplified PC maintenance and therefore more time for billable hours. 6. Mobile Device Compatibility – we are becoming more dependent on our mobile devices including smart phones, tablets and laptops every day. Whether you are in court, at a client’s office, at home or on the road, when you are in the cloud – you can login to your apps and data regardless of the device you need to access from. If you have an in-house server, you are limited to the workstations that are networked. 7. Decreased IT Time & Costs – IT labor hours go away for the apps, data and servers that are moved to the cloud. Local Infrastructure costs go down including time to maintain and repair. Cloud9 Real Time builds custom cloud solutions for legal firms across North America. With a private virtual server, you can host ALL of your software applications, data and users in one central location – and access Anytime, Anywhere.